I didn't get a simple moments post up last week...because we were in the middle of a crazy late winter snowstorm! 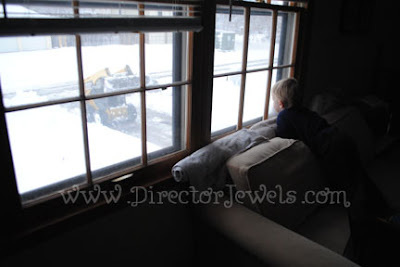 My blogging schedule has been thrown off because of all the snow days - even if we are home every day, when there is snow coming down out the window, it makes more sense to do out-of-the-ordinary things. 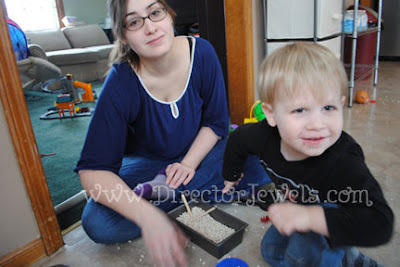 The first snow day, we spent some time doing Pinterest activities - playing with beans and measuring spoons was first. While it really is a good idea, it turns out that a two-year-old boy will have far more fun by tossing handfuls of beans in the air and across the kitchen. After about five minutes, it became clear that he was not going to use the nice measuring cups, muffin tin, and bread pan that I had for him to play with. Oh well. After that semi-fail, we decided to try another idea that my friend Stephanie posted last week - toddler science experiments. This one also didn't go quite as well. Lincoln mostly wanted to eat the baking soda and vinegar - yes, even after trying it several times, he kept eating it. Gross. 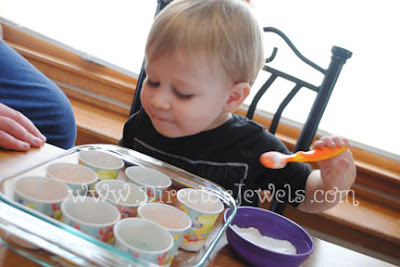 We found that he wanted nothing to do with dropping vinegar in the pan of baking soda - but he did enjoy dumping baking soda in the paper cups to make mini volcanoes. This entertained him until we ran out of vinegar - which was pretty quickly. We were stuck inside, but I had fun finding some simple moments throughout the day - my OCD hubby had to organize all the Mega Bloks by color, my also awesome hubby made us some banana pancakes and Apple Pie Oatmeal for dinner (and it was delicious), and my sweet baby spent a lot of time being snuggly. There was, of course, lots of napping and nursing by the littlest family member. What is it about snow days that make you sleepy? He called it a "track-ey" - tractor. We got a lot of snow and decided it was worth the time Andrew would save to just pay someone to clear our driveway! Turned out to be great entertainment for Lincoln, when it was accomplished with a Bobcat. He was absolutely thrilled - a truck in his own front yard! While snow days are fun, I'm kind of ready to get back into a "normal" routine. What simple moments made you smile this week?